Julie sent me Dr. Oswald’s Professional Therapy MuscleCare Extra-Strength Roll-On Gel product to try and I was obviously excited to receive a package in the mail! The first thing to spark my interest was that MuscleCare pain reliever is an all natural, carcinogen free product. I am all for natural products that aren’t going to harm your body! My knee has been giving me problems so I decided that would be the best place to try out the product. I love that I didn’t have to use my hands and the product just rolls right on and doesn’t have a sticky feel. I’m also a fan that the product is stain-free. Because no one likes stains like the ones deodorant gives your favourite black shirt! Within 5 minutes I could feel the MuscleCare working and I couldn’t feel any pain during my 7 K hill workout. I like how deep the product seeped through all the layers of my skin to reach my knee joint and that the menthol scent isn’t too overwhelming! I will be keeping this little guy in my gym bag from now on. I love how it’s small and compact. It fits so well in the pocket of my gym bag and I can even carry it around in my purse just in case I need it! 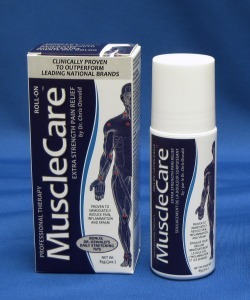 This entry was posted in MuscleCare, Review by Siobhan McCarthy. Bookmark the permalink.